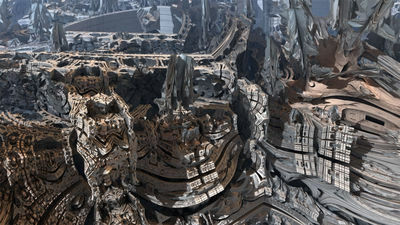 The only place I ever go on a regular basis to see fractal art is Fractalforums.com. I don’t pay much attention to the names only the artwork. So when a name like reallybigname becomes familiar to me it can only be because he’s been consistently uploading interesting work. It was the colors that caught my eye, but on viewing the larger image I was genuinely shocked to see the incredible detail and stunning 3D depth to the image. 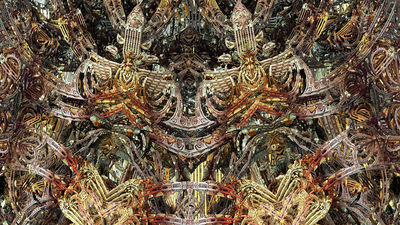 This was apparently made with Jesse Dierks’ Mandelbulb 3D but I’ve never seen anything like it from that program or any other. Everything is just great; the color, the lighting. And like the first one the incredible detail is …incredible! Really crisp, high-quality rendering too. 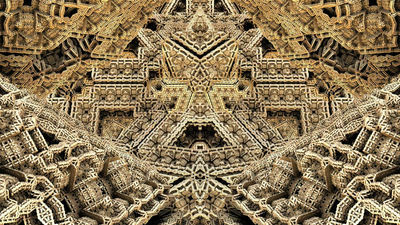 This is a new benchmark for Jesse’s program and the 3D fractal category probably too. Reminds me of the crisp, detailed and very stylish images by “blob” I reviewed in a post a year ago. 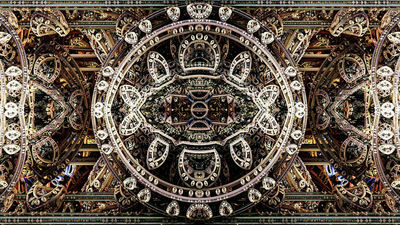 This is the geometric engines of fractal art working in high gear; who could ever make artwork like this by hand? And could they do it better? The best any hand made artist could do to approach this sort of thing would be to copy something like this. The first genuine all wood 3D fractal image. Wooden fractals? Doesn’t it look like wood to you? This reallybigname guy has too much talent. Who is he? Slideshows seem a little tame compared to 3D flythoughs, but this serves as a nice portfolio of reallybigname’s work and suggests, I believe, that discovery is a big part of making interesting fractal work. There’s a wide range of imagery here but his recent Mayan Trickster series are the best. In fact, I think the Mayan Trickster images are a good example of the graphical designs strengths of fractals that I talked about in my Rebooting Fractal Art series of blog posts. 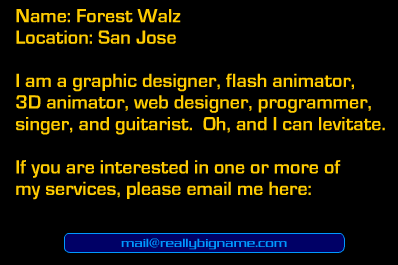 Reallybigname’s Mayan images may not be Picassos or Rembrants, but they are very good at what they do. And what they do is excel at complex graphical design; something Picasso or Rembrant in fact could not do as well as reallybigname here has done. We need to start thinking of fractal art as the domain of geometric design and rich graphical wonders like these. Baseball players don’t make good swimmers, but when they stick to playing baseball they really shine. Reallybigname has just hit a homer with his Mayan series. There’s nothing speculative or subjective about that; anyone can see how fractal algorithms excel at this kind of artwork. Fractal art is in a class of its own and this is some of the best of it. So parameter art can still be art now? And technical achievements and pretty and decorative graphical designs count as art and not craft by your standards? At least be consistent with your views. The very article you just linked to within this one says, and I quote “But I firmly believe that no one has, or ever will, create a real piece of art just by using a fractal program. Fractal algorithms just don’t have what it takes to produce anything other than mere decoration or design. As good as that can be, it’s lifeless when compared to real art.” . And now it’s a class of its own and one can excel at it only if one posts their art on fractalforums and not on deviantart? Don’t get me wrong, I like the art you posted here. I just don’t understand why you do, in light of your previous articles. Esin, it’s all about the “medium”. As for “art”, I will only say (as I’ve said many times before) that there is *fine* art and *decorative* art. Even the part you quoted explains that. You would do well to spend as much time reading the postings as you do writing your comments. Maybe then you’ll understand why I like this art? and what I like about it.